We have been awarding scholarships to more than 500 students since the 10 years that we have been working in the capital. We believe in women empowerment and have been working actively on encouraging female artists. We believe in expanding our movement throughout all the nooks and crannies of our country. We believe in the power that music has to change lives, it has the power to change how people think. Once a year our Director, Mariano Abello, who has spent many years in Nepal building this school, visits us from Spain to help us on things we need his first hand approach on. We, together with him, work to tackle the many hurdles in our way the we need to face if we are to truly reach the population of Nepal. 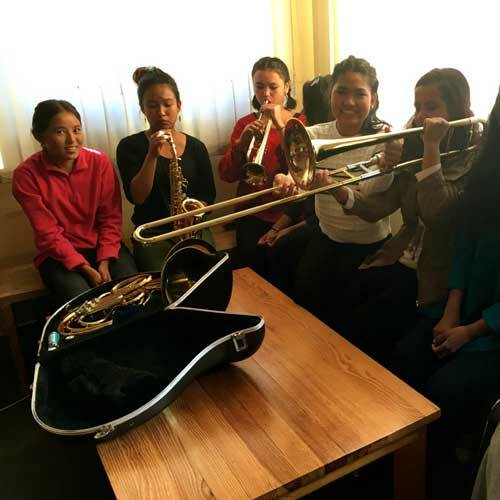 In our efforts to empower music education in Nepal, we are now training a group from an orphanage we have been working with, Nava Asha Griha (NAG), to be the first all girl brass section in Nepal. They are learning to play instruments like the trumpet and trombone at our school. Apart from this we have been working with many disadvantaged-individuals, schools and orphanages to give them scholarships and provide quality music education. Check out the social projects we are working here and support our work.